Rachel Stevens is calling out to mums, dads and parents to donate a blanket to the Dettol Baby Blanket Donation charity campaign to help babies in need. The campaign aims to raise awareness of the dangers of bacteria on baby blankets whilst highlighting the shortage of baby blankets available to infants born to families in need. Once collected the baby blankets will be hygienically washed with Dettol Anti-Bacterial Laundry Cleanser, an additive that kills 99.9% of bacteria even in temperatures as low as 15°C, before being re-distributed to families. 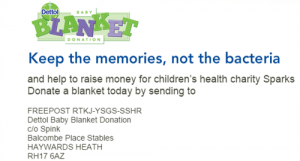 Dettol has also pledged to donate £1 for every blanket donated to Sparks – a children’s medical research charity. The Dettol Baby Blanket campaign video can be found through the following ‘here‘.